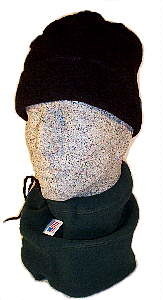 The Gaitor is a more compact alternative in headwear and made of Polar Fleece that is warmer than wool times two! Tighten the cinch string and wear it as an ultra-warm cap. Or, open it up and pull it down around your neck to keep winter cold in check.